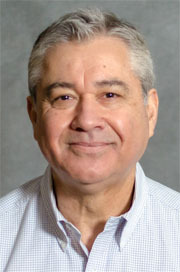 As Accounting Manager, Carlos oversees the WSLC’s financial department, including its financial services management system, general ledger analysis and interim financial reports. He works closely with the Secretary Treasurer, Accounts Payable Clerk, and the fiscal departments of various state and federal government agencies to ensure proper fiscal procedures for grants, contracts, and the council itself. A member of Office and Professional Employees International Union Local 8, Carlos joined the WSLC staff in June 2016. Originally from Southern California, Carlos has been a member of the Teamsters, Meat Cutters and United Cement, Gypsum & Lime Workers unions. After leaving the blue-collar world, Carlos returned to school and earned an accounting degree from California State University, San Bernardino. Upon graduation and relocation to the beautiful Pacific Northwest, Carlos worked in the private-sector financial arena spending more than 20 years in the chemical distribution industry. Evolving motivations and changing life perspectives have led Carlos to the non-profit world, where he has worked for an organization that addresses homelessness and now with the WSLC. He is proud to be part of an organization that supports the struggle for fair wages and social justice.